We need people and governments to be aware that none of these are far-away problems — what happens in the Arctic, in the atmosphere, and in the world affects us all. And people and governments need to understand that climate change isn’t a problem just for the future, for 2100 and beyond. This is a problem right now, leading to enormous and tragic losses of life and property and money and ecosystems — right now. I had the pleasure of interviewing Dr. Leslie Field, the Founder and CEO of Ice911. She is an inventor with 54 US patents. She is also a Lecturer at Stanford University and is the Director of the Center for Climate Restoration’s Polar Restoration Action Group. At the time I decided to tackle climate change devastation, I was already well along in my career of engineering and inventing. I had earned degrees from MIT and Berkeley in Chemical Engineering and Electrical Engineering, and had worked in industrial R&D at Chevron Research and Hewlett-Packard Laboratories/Agilent Laboratories, where some of my inventions had made billion dollar impacts. I was also a Consulting Professor at Stanford University, and had started two consulting companies specializing in Micro-Electro-Mechanical Systems (MEMS). The decision to add more to my plate, as an entrepreneur/working Mom, started with seeing the first “Inconvenient Truth” movie in 2006. I was devastated to see expert after expert agree that the effects of climate change would be severe, and soon, and it knocked me flat. As someone who always had loved Nature, I was surprised I had missed this. And as I thought about what this would mean for my two children, then 6 and 10-years-old, I knew I had to do something to help them. As an engineer and inventor, with the benefit of a great education, I asked myself, ‘If not me, who? If not now, when?’ — and I added “habitable planet” to my already bursting to-do list. The Ice-Albedo Feedback Effect got my attention as something that would greatly affect climate, and drawing on my experience in engineering and materials, I asked myself ‘could the loss of reflective ice in the Arctic could be approached as a materials problem?’ That framing of the challenge was very helpful, as that made climate change into a problem that I knew I had some skills to take on. Our focused mission is to restore ice in the Arctic, with the goal to avert the worst impacts of climate change across the planet. The Arctic has lost 80 percent of its ice since 1979. 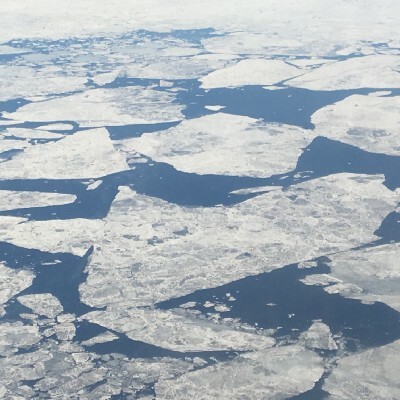 This loss of ice and snow is now accounting for at least one-third of global temperature rise, as well as drought and wildfires in California, worsening Nor’easter storms in New England, increasingly severe tropical storms, and harsh winters in Europe. Restoring ice in the Arctic will lessen climate devastation and species extinction, while we reduce CO2. In fact, restoring ice in the Arctic now appears to be the single largest, safe lever we have to reduce climate change impacts on the world. It will help give us some time and hope to decarbonize our energy mix and our atmosphere as soon as possible. I started my work in climate with the idea that it would be the “backup plan” I hoped we’d never need — that the world would make the agreements, implement the conservation measures, change the energy sources to renewables, and all would be well. 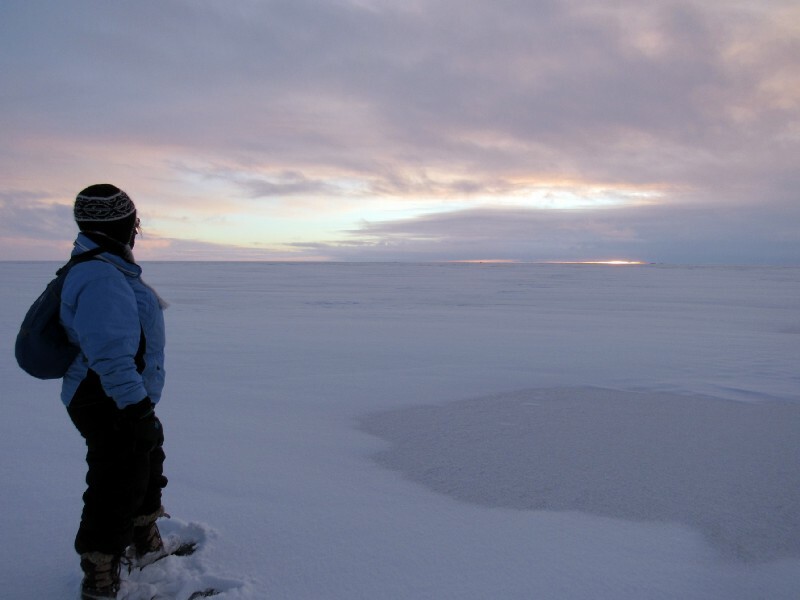 But as time went on, I realized that this work to save Arctic ice could really be critically important, and the overarching initiative became to develop a practical, field-tested solution to be at the ready as soon as possible, to be called upon when it was needed. It appears this time of need is now, and as soon as possible. In developing the solution, my first rule was to copy the Doctor’s creed of “First do no harm” — which for Ice911 means that we rebuild a natural system (ice in the Arctic) that was there until very recently — and that we use the safest and most benign material we can find (silica, which is already present everywhere as sand, and in rocks, and in the ocean), in the smallest amounts possible to get the job done of restoring the ice. Our initiatives center around gaining the permissions, field experience, and climate modeling to know we are doing the safest job possible, with the most strategic and effective choices of: where to deploy, what to deploy, and when to deploy our solution. We find ourselves in a cycle of climate modeling, obtaining permissions and access to do field testing, and then conducting doing the field testing and monitoring. This allows us to develop the process, document the results and to confirm no harmful subsidiary effects. Added to these steps are the needs to raise enough funding to do the work, to present the work to the scientific world for peer review, and to let the general public know what we’re doing and why there is an urgent need to do it. Leslie: What was the most difficult thing you faced when you first started your company/organization? Can you share how you overcame that. This might give insight to founders who face a similar situation. It’s a good thing that I got this work started in 2006 so that we have it developed now, but in many senses I was about a decade ahead of my time. That early start meant that few understood why I was working on this issue, and few were ready to lend support in those early days. I would often be greeted with mystification from people I told about this — most folks just couldn’t relate — it seemed so far away, so distant in the future, so big. As a result, figuring out how to fundraise for this, where to get the permissions and access to start some field testing, and how to proceed was often lonely work wedged into that already busy, working/entrepreneurial/Mom’s life. With very slim funding, this work went on for many years as a strictly volunteer effort (which I dubbed my ‘Inconvenient Hobby’), and meant a lot of hard work, a lot of lost sleep, leading to slow but steady constant determined progress. You see, ensuring a habitable planet for my kids was something I couldn’t let go of. The ‘Mama Bear’ in me had been activated — and I wasn’t going to walk away from this mission. Fortunately for me, there were some people who got it early on, and who encouraged me from the beginning, including Dr. Steve Schneider and Dr. Terry Root at Stanford, who were the first climate experts I told about this, and Laure Woods, a friend who got it, and who gave Ice911 its first donation and has been a key supporter ever since. If they had told me to quit I would have kept thinking until I found some other way to address climate change. Instead, they told me that this was a good idea and that I had to keep going on it. My kids, who I was doing this primarily for, got it too — though after a couple of years, I could see them starting to wonder why I hadn’t gotten this solved already. As they’ve gotten older, it’s been great watching them really get it, on an adult level, and to see our family members adding to our team as volunteers when they can, because they see how important this work is. Fortunately as well, I have a background of perseverance, having been a woman in STEM starting from a time before that was thought to be acceptable or cool; and I have always had a great fondness for heroes who keep searching for solutions to desperate situations, until they find one where everyone can win, rather than deciding it’s just too tough and walking away. Ice911 is a non-profit because I never wanted shareholder interest to sidetrack the goal of safely restoring the Arctic. Our first defining principle is ‘First Do No Harm,’ and we believe being a non-profit helps to ensure that we’re using the safest material possible, even if some less-costly — but less-safe — material were available. Of course we’re also pragmatic, and have worked very hard to find a safe material and solution whose cost comes in at 1/10th of the cost to deploy versus other solutions. I started this on a shoestring, powered by volunteering and ultra-low cost for testing to start with, and that’s always a possibility if you can afford the extra work and lack of sleep that entails. We still face an education problem, in regards to many of the larger granting and family foundations, because most people aren’t yet aware of just how much the ice loss in the Arctic is affecting us in our own backyards. That’s not to say, however, that large grants can’t be found. -We’re tapping into a network of very strong climate activists in Silicon Valley, and they’re helping us grow our a combination of individual, family foundation, and granting foundation funding to make our impact on restoring Arctic ice — in time. My advice: If you can, have yourself and/or your team accept as many opportunities to present and meet with interested parties as you can. Always ask if the person you’re meeting with could connect you with one more person who may be interested in what you’re doing. You never know what you could miss if you don’t ask. Also, don’t be afraid of rejection. Your organization needs to send those cold emails, make calls, and just show up to those meetings even if you’re not sure this is the big one; you’ll be surprised where some of your best supporters come from. I believe we need to be “all in” and all working together to solve this. That is, we need entrepreneurs, businesses, governments, and citizens all working together to solve climate change and global warming issues. More broadly, we need science, policy, engineering, finance, governance, permitting, and the public, all working together, to solve this existential crisis for humanity, arguably the biggest crisis we’ve ever faced. These are international problems, national problems, and problems in our own backyards. They’re problems for those of us in harm’s way right now — and they’re problems for the future of humanity. So — no — this is not a binary either/or problem for only one or another group to solve. Various types of groups’ efforts can complement one another if we do it right. Some of the first actions to speedily develop solutions can be invented and developed by entrepreneurs. And some of the most effective actions on climate and infrastructure may come from public-private partnerships that apply private business models to public problems, and use government’s backing to finance and push the project through. Most importantly, if you’re talking about a climate solution, ultimately it will need to scale it to a level where it’s making a measurable impact on climate change. That means that a government, or more than one government will be involved along the way, for permitting, funding, and/or governance. If you are an entrepreneur, I’d advise that you try to build those relationships early, through conferences, meetings, and networking, to find those people who can help guide you through the sometimes exacting process of working with government. Governments can help by putting policies in place to limit fossil fuel emissions and to encourage work to restore the climate through rebuilding Arctic ice and stabilizing all polar ice; changing to more sustainable fuels; and developing methods for CO2 drawdown. Restoring Arctic ice is, right now, the most effective, safest lever to avoid worsening climate devastation; giving us time to do all the other hard work of climate restoration. We all need to start conversations about the Arctic — let’s get people to talk and think about it! Not all of us in the mid-latitudes know or care yet about the difference between the Arctic and Antarctic; or that both are losing ice. We have to first explain why Arctic ice loss matters to people in the mid-latitudes in terms of temperature rise and extreme weather and devastating impacts; then we can get into our solution for not just slowing the melt but restoring ice with repeated application of Ice911’s material over a period of time. For the west coast, Arctic ice loss directly influences the California drought and wildfires; for the east coast, it has led to much more severe Nor’easter storms; and for the South, it contributes to the increasing severity of the storms and flooding that are, sadly, becoming commonplace. We need to restabilize the jet stream and historic weather patterns, and restoring Arctic ice is how we are going about it. There are so many people I would love to thank. The list is long — our Ice911 team and collaborators, our governing board and advisory board; all of the foundation and individual donors and supporters who have helped the work along the way; my family and friends; and the many wonderful people I have met on this amazing journey. I sometimes feel our entire town deserves to be listed as a key cofounder/key supporter. And in many ways this work has given me a very large and far-flung extended family. Over the years, especially during some of the many difficult moments along this sometimes-lonely road, the people who would stop me in the grocery store or our kids’ schools and ask me how the ice work was going, or if there was a way to help, were really important in keeping my spirits up enough to keep working on this. Sometimes it’s hard to stare into the fiery pit (or as Al Gore puts it, ‘to go on a Nature walk through the book of Revelation’). It’s a powerful thing, to let your mind process the reality of what happens if we don’t do anything — and then to keep going at full speed with the incredibly important work needed — to steer us away from the worst of that potential horror into an acceptable future. Smiles and kind words along the way help much more than you’d expect. There are so many wonderful moments I could mention here — too many to describe in any detail for now — of shared trips to the Arctic to do field work: awesome, infinite-seeming twilights, sunrises while driving our snowmobiles to our test site, shared conferences, talks and poster sessions to present our work. The simple peace of visiting a quiet California lake test site all alone or with one other volunteer years ago, back at the beginning, gathering data, testing materials, sharing meals, setbacks and sorrows, as well as hopes and triumphs, and vast mutual support from and to us all throughout. It’s wonderful to be sharing this incredible and adventurous journey with this large extended family — and this has all added to living a far more meaningful and varied life than I had ever imagined. Actually, for the past nine years, I’ve taught a class at Stanford called “Engineering, Entrepreneurship and Climate Change.” It’s meant to be a crash course on how to do something meaningful related to climate change. It gives an overview of the climate situation and its impacts on the world’s ecosystems and creatures (including humans); how science, policy and engineering can work together to solve this. I invite an amazing group of inspiring speakers with insights and experiences to share in restoration solutions, entrepreneurial and scientific work in renewables, conservation, electric vehicles, funding, policy, on the spot observations of changes in the far reaches of the world, and how to solve “impossible” problems. 1. It is so very hard. You can not believe how hard it will be until you are doing it. The mountain ranges of challenges stretch beyond you, unimaginably far, each range higher than the one before. You may need to go it alone at first when you’re the only one who believes or can commit — but don’t stay alone too long. You will gather and benefit from companions on the road who will help you broaden your reach and impact; create new opportunities to accelerate the work; help each other past your weaknesses, and share your strengths; keep your thinking broad enough; keep your spirits up; keep it fun; share your load, and share your stories. 2. It is amazing. You can not believe how amazing it can be until your breath is taken away by a breakthrough, an insight, the aurora borealis, the new incredible opportunity; the endless sunrise ahead of you with a rainbow half-ring above it, as you drive out to your Arctic test site on a snowmobile, the closeness of flying to the Arctic with your youngest son (one of the people you are especially doing this work for) so he can volunteer to work with you at -22F outside all day on your field testing. Wow! Who could have imagined? Oh, the places you’ll go! 3. Really communicating with people is essential. For an engineer like myself, highly trained over many years to communicate compactly, with all the jargon included so that fellow engineers and scientists who know exactly what that technical term means, can power through with you to collaborate most efficiently; well — NO — that is not what is needed when you talk with most people. Instead you will need to use the non-technical language the rest of the world uses. You need to make sure that what you are saying is in the terms your audience knows, not technical speak. And while, if you’re a dedicated and deep-thinking technologist, you probably love the details and want very much to share them (all of them) — you will need to quickly learn to tell when you’ve said enough, and how to listen to what the person you’re speaking with wants to ask or tell you, to make sure you really are communicating. If what you’re doing matters, you will need to communicate in a way that people understand. 4. Jump on the important opportunities when they come along. How I wish Dr. Steve Schneider and I had collaborated on the journal paper he had suggested we might write sometime, before he (all-too-soon) passed on. It likely would have accelerated the work, and it would have been a terrific experience. But I was very early on in getting the work going and tested, I wanted to get some more field testing done before I felt absolutely sure that I had the right approach, I wanted to know more about what impact the work could have, and we both got busy…Opportunity may knock more than once, but if you don’t answer until the 2nd or 3rd time, you will probably have considerably more work to get there — to where you could have been if you had answered that knock, and jumped on the opportunity the 1st time. Do the most with the least. Work with full transparency and permission. Thank you! And you’ve got me thinking with this question. People seem to find it extraordinary for a person to have had the imagination to come up with an idea like saving the Arctic with just a harmless bright reflective material, and the persistence to carry it through for a dozen years to get us to where are now. But I think each of us has it within ourselves to do something like this, though many of us don’t realize it yet. We each have free will, even if our current circumstances constrain our choices, and we have inside each of us an enormous potential power for good. So maybe the great idea to ignite would be for more of us to realize the extraordinary impact each of us, with our own passion, work and life, could have. Each of us living into that — can you imagine what a revolution for good that would be? We have the power of our thoughts, our insights and our time. We know exactly what we would save if the fire or flood were upon us and we were fleeing for our lives. Our families, friends and neighbors, our pets, maybe our instruments, easels and laptops. Or broadening out — the animals, the ecosystems, the many beauties, our homes, humanity, the world. The world has a number of terrible problems that threaten all of us, and all that we love. What if we decided we wouldn’t give up, we wouldn’t ignore the problems, but that instead we would take action to save what we love, and that we’d take that action with all our heart, mind and effort? ● What if I could help in protecting/saving what I most love? ● What are my skills? Could I add a skill I would need? ● What could I do that could make things better, not worse? ● What will I think about, read about, talk about right now? ● What can I put into action in a quiet, first-do-no-harm way to explore and test my ideas? ● Who can I find to listen to my idea thoroughly and non-judgmentally, and might they help? ● This practice may start me on a long journey. What’s the next right step I can take now? What is the best way for people to follow you on social media?